wrapper adds an upscale touch to any facility. Individually wrapped. Brighter and whiter tissue. Safe for sewer and septic systems. 4.5-in. whiter tissue. 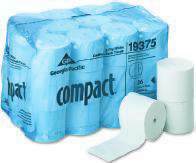 Safe for sewer and septic systems. Individually wrapped. 100% total recovered material. Meets EPA CPG requirements. 90% total recovered material. Meets EPA CPG requirements. Two-ply. White. 4.09 x 4.0 sheets. 506 sheets per roll. 60 rolls per case. hygienic bath tissue system reduces potential of product contamination. requirements. 4.5 x 8.3 sheets. 250 sheets per pack. 36 packs per case.
. Meets EPA CPG requirements. White. 4.0 x 4.0 sheets. 506 sheets per roll. 80 rolls per case. and 100% total recovered material. Meets EPA CPG requirements. Two-ply. White. 3.85 x 4.05 sheets.